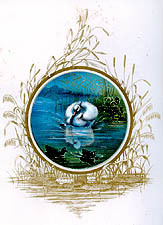 Joseph Wolf, whose work appeared in John Gould's Birds of Great Britain, was also the artist for one of two small companion volumes in which chromolithography was used for the first time to reproduce bird illustrations. These books were intended for popular distribution and were attractively done, but Wolf was disappointed in the chromolithograph plates. He never again allowed his work to be used for other than scientific publications.